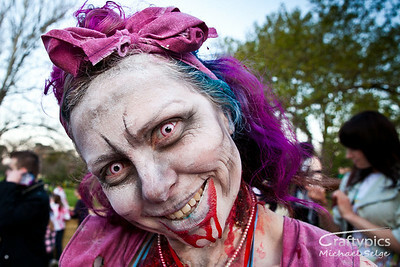 For the 3rd year in a row I have headed down to the city to capture some images from the Annual Adelaide Zombie Walk. The 2008 Walk was a fairly small affair with a few hundred Zombies scaring unsuspecting Diners in Rundle St as they headed down on the way to Hindley St and Light Square. Well fast forward to 2010 with an Active Facebook page and the numbers have swelled significantly and the Police have to get involved to close off whole city intersections whilst the Zombie meander from one side of the city to the other. This years walk travelled down Grenfell St rather than the mall, but there were still quite a few unsuspecting citizens out on a Saturday night wondering what was going on. Of course none of this is possible without the organisers in pulling everything together and of course the public, some of who go to extremes to have the best make up/ costumes they can and to whom the photos would just end up looking like tomato sauce splotched faces. hey man, awsome shots. 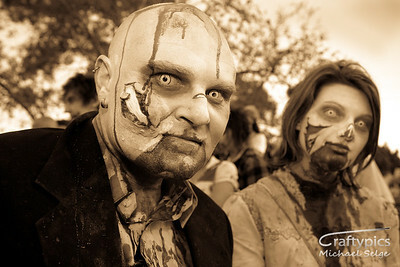 \The 2nd zombie pic you have there is of 2 very good friends of mine. They speak highly of you as apparently you have run into them several times~!